Achieving zero school drop-out rate and increasing educational attainment of the children from the safaikarmachari community are key to ensuring that the next generation is not forced back into their parent’s caste-based traditional occupation. Towards this end, Thamate has been running evening educational support centers called Bheemshales in residential areas of safaikarmacharis in Tumkuru district where teachers from the community support students with their studies. Additionally, during Feb-March of every year,for children in Class IV, we organise pre-examination coaching classes for entrance tests to government-run residential schools like Morarji Desai schools, Kittur Rani Chenamma schools and Navodaya schools . The state government has issued notification which grants direct entry to children of safaikarmacharis to the state government-run residential schools. But for the workers in rural areas, it is proving very difficult to get employment certificates from the Panchayats certifying that they work as safaikarmacharis. Hence most of the students still have to clear the admission tests. For the admissions to Academic Year (AY) 2018-19, 144 students took the coaching classes and 80 of them cleared the exams including 40 boys and 40 girls. The number of students who cleared the exam for AY 2018-19 is nearly twice the number of students who cleared it for AY 2017-18. The number of bheemshale students getting admissions into state government-run residential schools has beenconsistently increasing over the last four years. This success has thrown up further challenges though. 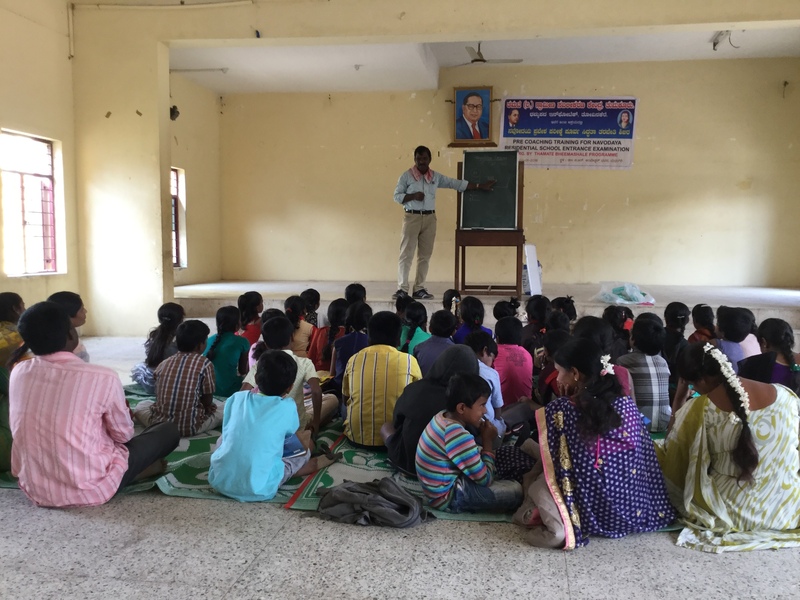 In several instances, children from Pavagada and Madhugiri taluka do not get seats in schools of their own taluka and are allotted seats in schools of nearby taluka which the parents find too far to send their kids. Additionally, in some of the residential schools the quality of teaching is not adequate which makes parents decide against sending their children. The better quality Navodaya schools have two few seats (only 80 per year for the whole of Tumkuru district) and with no affirmative action provisions for children from the community, it is a daunting task for students to clear the entrance examination. But we are working hard towards reaching that goal and that nut will also crack some day. Meanwhile, 11 bheemshale students who cleared SSLC students have joined I PUC college, deciding to continue education beyond school. 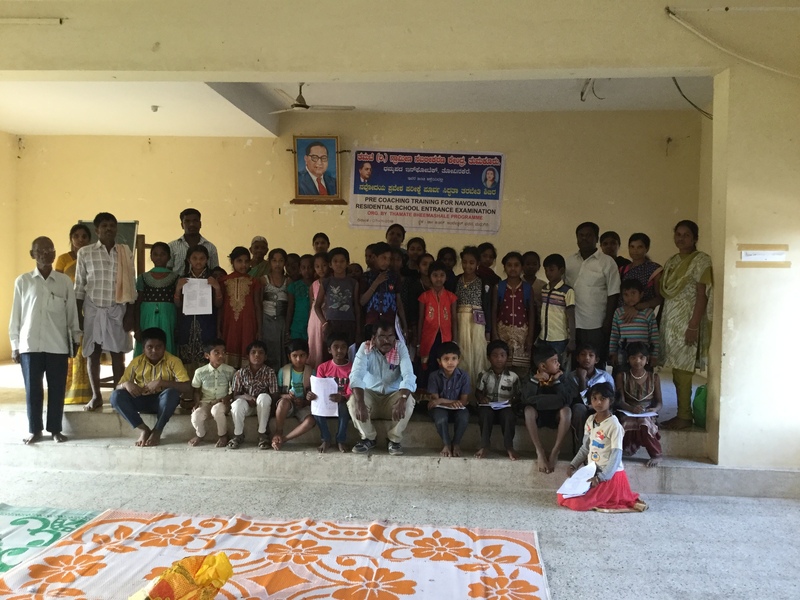 Historically, SSLC has proved to be the hurdle, after which most students from the community would drop-out of school and start working at home or with their parents. That has begun to change now, as more and more students pass SSLC in first attempt and with grades high enough to get admission to Pre-University Colleges (PUC). But this first generation of students going to PUC woul require both financial and non-financial support as the cost of education at this level is high and so is the pressure on them to leave their education and join their parents occupation.